The Reviewer plugin supports WordPress localization. You can translate the plugin into your language by simply translating a list of labels. There are two ways to translate the plugin: a simple one by using a WordPress plugin that handles the translation process directly in your admin area or a manual way using a local app. There are several WordPress plugins that handle the translation in admin area directly. You can choose the one you prefer because the Reviewer plugin respects the standard WordPress localization technics. We suggest using the Loco Translate plugin, it's very simple to use and you will be ready in a few easy steps. The Loco Translate plugin is not included in Reviewer plugin so you need to download and install it manually. We do not provide support for the Loco Translate plugin so please read its documentation or contact the author if you have any questions or issues. If you don't want to use a third-party plugin then you can translate the plugin on your local computer. Follow the next steps for completing the process. Before going ahead, choose the language you want and find the WordPress extension language on the official page. In our example, we are going to translate the plugin in Spanish language, so we pick the extension es_ES from the WP Locale column. Inside the reviewer folder, you can find a subfolder - named languages - that contains all available language files. 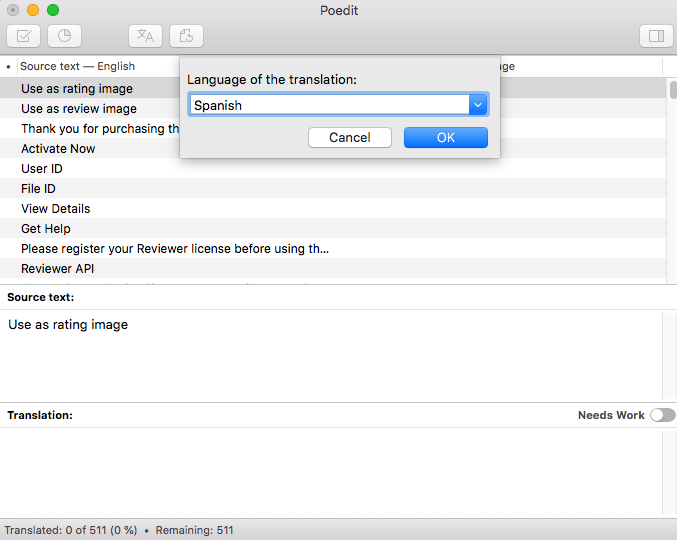 Open the reviewer.pot file with the Poedit app and choose the language in which you want to translate the plugin. Translate the labels you need. You don’t need to translate all the labels. Save the new file translation in the same folder - reviewer/languages - and named it reviewer-[language extension].po Replace the [language extension] text with the language extension you have found previously. In our example, the file name will be reviewer-es_ES.po for the Spanish language. If you translate the file outside the main reviewer/languages folder, you need to upload both .mo and .po files that Peoedit created. Once you have completed the process you need to set the language of your WordPress installation from Settings > General > Site Language and you should get your Reviewer Plugin localized. The plugin is already localized in English - default language - and Italian.